Clockwise from top left – Lei Cha with White Rice (RM7.90); Lei Cha Fried Rice (RM9.40); Claypot Pork Trotter with Vinegar (RM11.90); Fermented Bean Curd with Pork (S – RM8/ B – RM15). 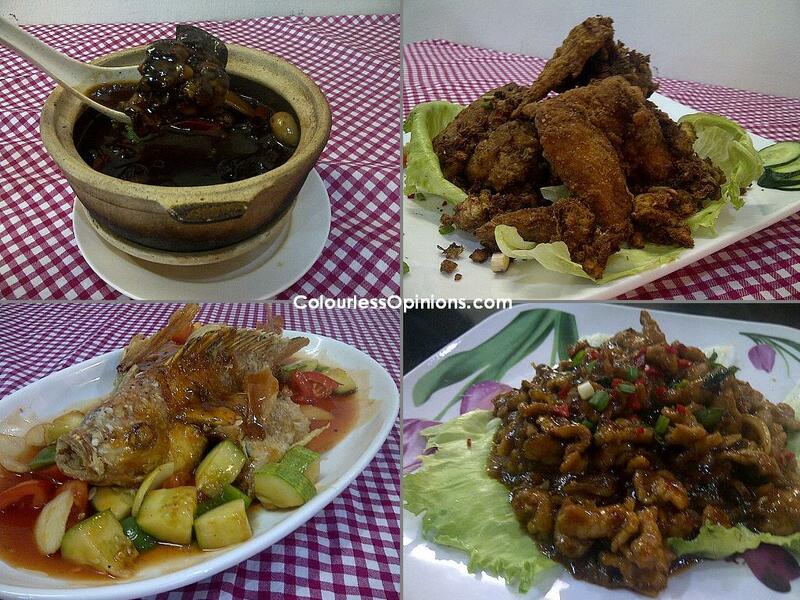 Clockwise from top left – Fermented Bean Curd with Pork (S – RM8/ B – RM15); Fried Chicken Wing (RM15); Special Jiang Bao Dish (RM10); Deep Fried Fish in Sweet & Sour Sauce (S – RM15/ M – RM25/ B – RM35). 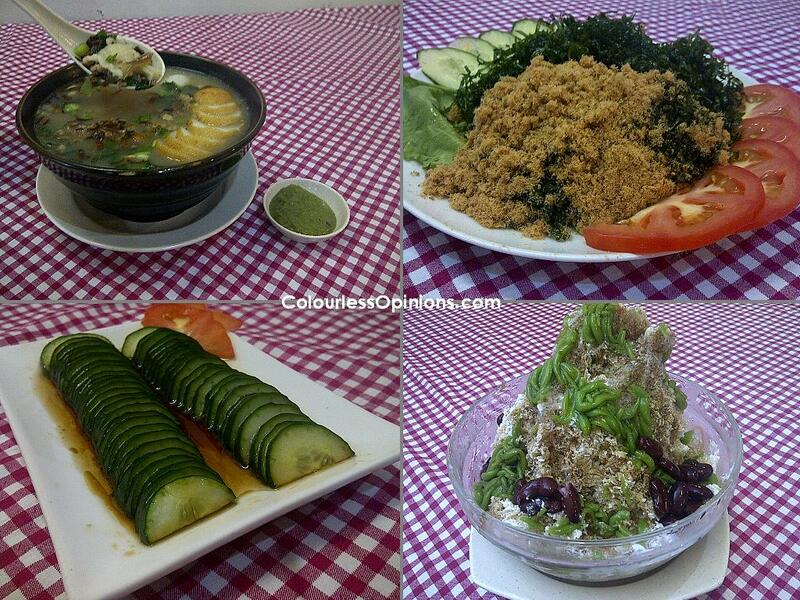 Clockwise from top left – Mee Hoon Kueh Segamat Style Soup (RM6.90); Crispy Seaweed (RM7.90); Cendol (S – RM3.50/ B – RM6.90); Special Cucumber (RM4). Clockwise from top left – Special Drink (RM3.50), Iced Longan with Ribena (RM3.50), Cincau Soy Bean (RM3.50) & Ice-blended Lei Cha (RM7.90); Ice-blended Cucumber Lemon (RM6.90) & Ice-blended Red Bean (RM6.90); Wok Dish Way outlet in Kota Damansara Petaling Jaya; the inside of the restaurant. 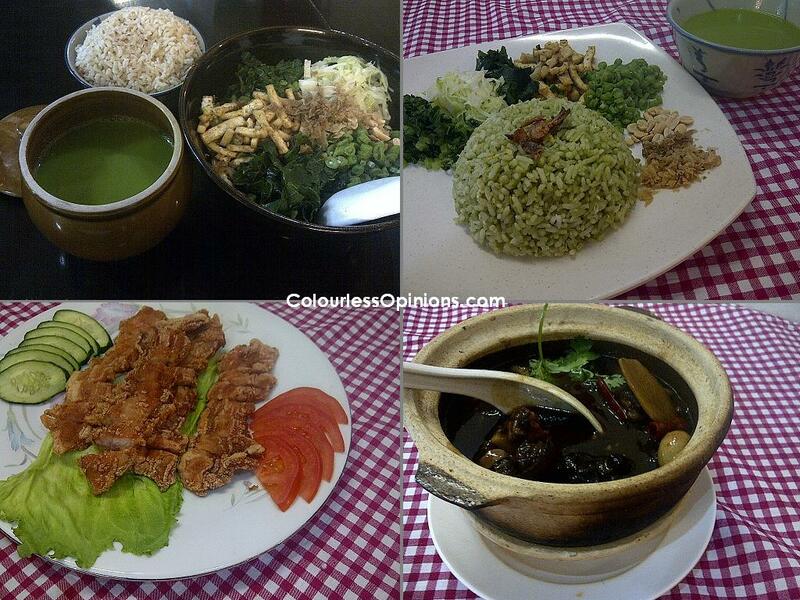 Verdict: Wok Dish Way has a broad variety of home-cooked food choices on their menu with lei cha as their signature; even non-vegetarian foods are available as well. From what I got to taste, non of the dishes are exceptionally spectacular nor ghastly. Although I wasn’t quite a fan of vegetarian food or lei cha, I liked the unique taste of the stuffs that were made with their signature ingredient. Lei cha lovers would definitely love what this restaurant has to offer. Great ambiance too. However, the portion of some of the servings are relatively small and the pricing is not completely reasonable. Favourite & most unusual: Lei Cha Fried Rice (RM9.40) – It is exactly what the name tells you. It tastes so weird, I liked it. Personally, I felt that it’s way better than consuming pure lei cha. However, almost ten bucks for just a small portion of rice and side dishes is overpriced. Least favourite: Special Cucumber (RM4) – It’s almost like eating cucumbers with cheap chicken rice sauce. The cucumbers do taste and look a little higher quality than the usual though. "Bu Zhi Dao" Lei Cha? Stands for "I don't know"? 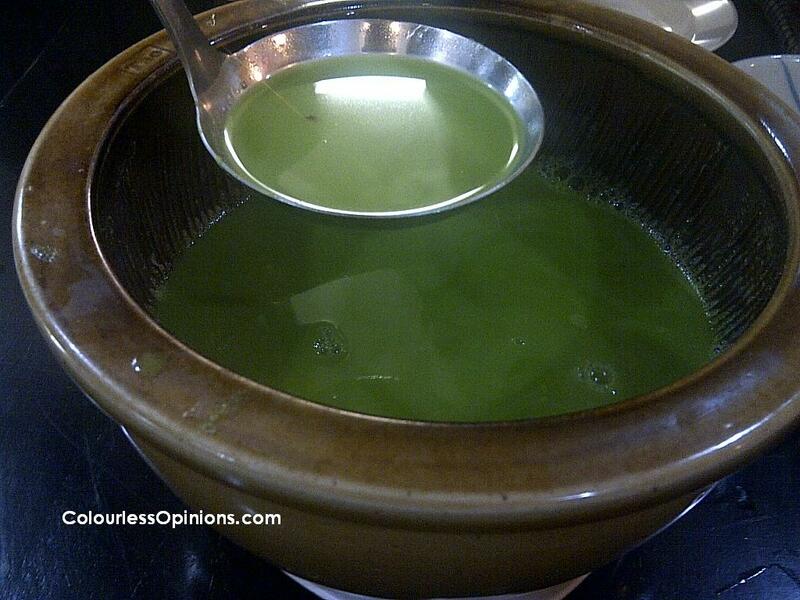 I never liked lei cha's 'green' taste. So this is a milder version? Latest: First Starbucks Breakfast & BCard Experience! Must eat again their lei cha fried rice! Looks like a worth the try because I have never done lei cha before. 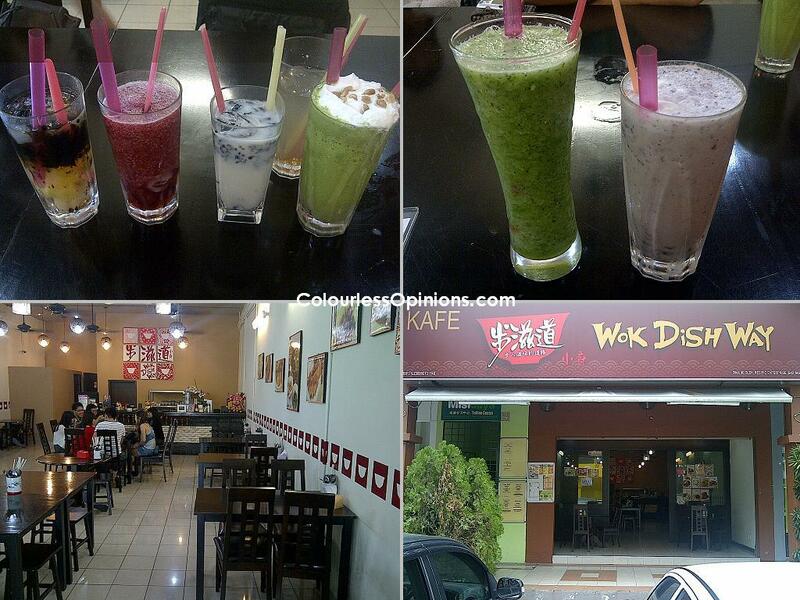 i love lei cha….will check this place out with my lei cha kakis.